CEFAR-250/500 to reduce the development of drug resistant bacteria and maintain the effectiveness of CEFAR-250/500 and other antibacterial drugs. 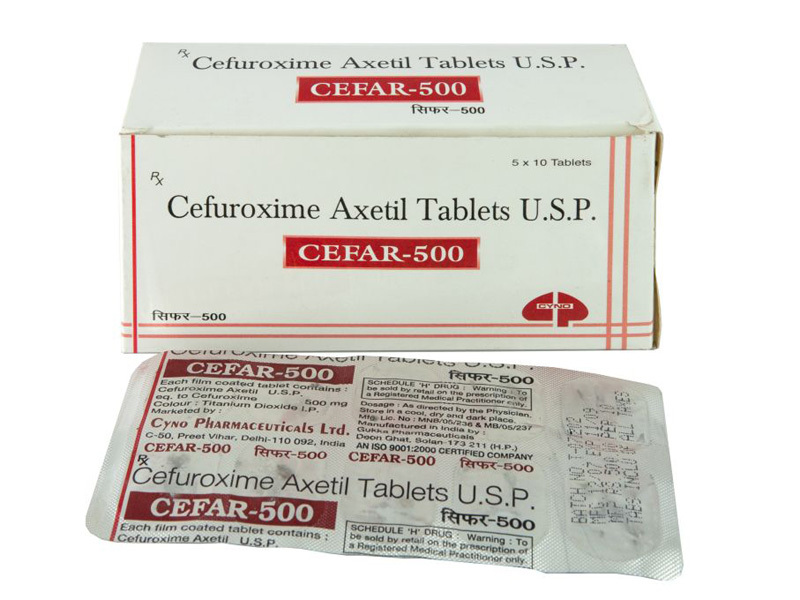 After oral administration Cefuroxime axetil is absorbed from the gastro intestinal tract and rapidly hydrolyzed by non specific esterases in the intestinal mucosa and blood to cefuroxime. Cefuroxime is subsequently distributed through the extra cellular fluids. The axetil moiety is metabolized to acetaldehyde and acetic acid. Approximately 50% of serum cefuroxime is bound to protein serum. Pharmacokinetic parameters of the dose cefuroxime axetil – 250 the peak plasma concentration 4.1 mcg/me. Time of peak plasma concentration 2.5 (hr.) and mean elimination (half life) 1.2 and AUC (area under the curve) 12.9 & cefar-500mg – peak plasma concentration – 7, time of peak plasma concentration – 3 (hr. ), mean elimination half life (hr.) – 1.2 and AUC -27 mcg-hr. me. CEFAR-250/500 is excreted unchanged in the urine in adults. Approximately 50% of the administrated dose is recovered in the urine within 12 hrs. Any medication taken in excess can have serious consequences. Overdosage with cephalosporin antibiotics can cause brain irritation leading to convulsions. If you suspect an overdose, seek medical attention immediately. Antacids -containing aluminum or magnesium, histamine2-receptor antagonists: increased cefuroxime absorption.Concomitant administration of probenecid with CEFAR-250/500 tablets increases the area under the serum concentration versus time curve by 50%. The peak serum cefuroxime concentration after a 1.5-g single dose is greater when taken with 1 g of probenecid (mean = 14.8 mcg/mL) than without probenecid (mean = 12.2 mcg/Ml). CNS Headache, Hyperactivity, Hypertonia, Seizures. GI Nausea, Vomiting, Diarrhea, Abdominal pain, Dyspepsia, Pseudomembranous colitis. GU Hematuria, Vaginal candidiasis, Renal dysfunction, Acute renal failure. Hematologic Hemolytic anemia, Aplastic anemia, Hemorrhage . Skin Toxic epidermal necrolysis, Erythema multiforme, Stevens-Johnson syndrome. STORAGE CONDITION Store in cool and dry place. Protect from light and moisture. The adult dosage may range from 125 to 500 mg taken twice a day. A single dose of 1 g is used to treat gonorrhea. Children under the age of 12 may take this drug safely, usually in two daily doses of 125 or 250 mg per dose. CEFAR-250/500 works fastest when taken on an empty stomach, but it may be taken with food if it causes stomach upset. For children the tablets may be crushed and mixed with food.